C turned two yesterday, and apparently that means that she no longer counts as a baby, instead she’s a proper little girl. A little girl who knows her own mind and makes damn sure you know it too, even if she doesn’t always have the words to explain it. Who gives the best hugs and kisses (if she doesn’t blow raspberries in your face first) after demanding ‘hug-ups’ (pick up). Who gives as good a rendition of ‘Let it Go’ and the My Little Pony theme tune as she does of ‘Wind the Bobbin Up’ and ‘Heads, Shoulders Knees and Toes’. Usually when you’re trying to get her to go to sleep. Who starts counting from 8 at least 80% of the time (8, 9, 10, 8, 9, 10, 8…) and still insists on calling her big sister ‘Ah’ even though she’s perfectly capable of pronouncing ‘G’. In other milestones that show how she’s growing up, she has chicken pox. 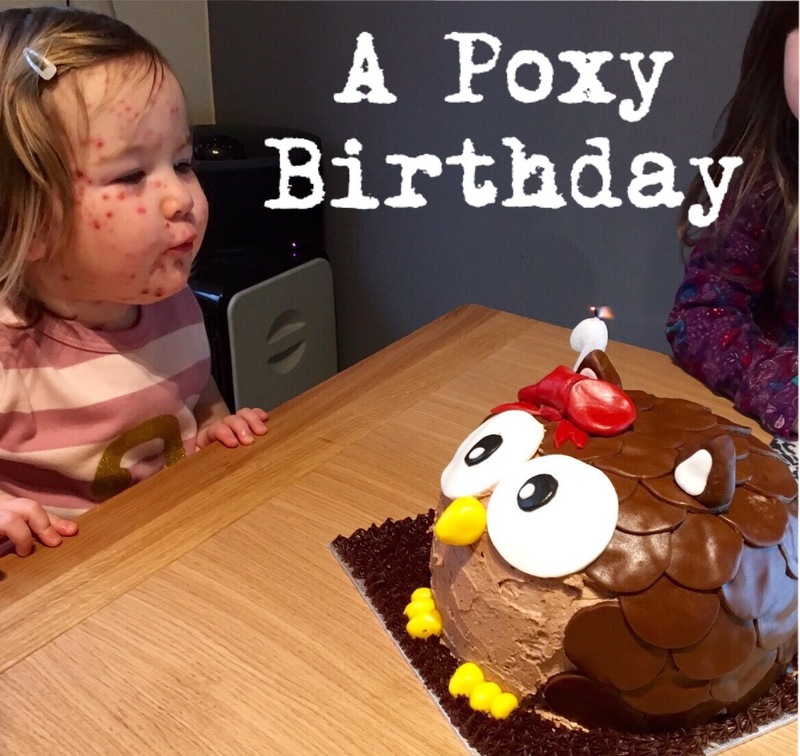 But this isn’t just chicken pox – this is full blown, head to toe, more skin with spots than without chicken pox. Her birthday marked day 6 of being poorly, which Dr Google reliably informed us meant she’d be feeling much better and almost back to normal. Which obviously wasn’t the case given that on day 5 we’d ended up at an emergency doctors appointment with a stubborn fever, concerns over possible dehydration and a diagnosis of an infection. So what little she ate of her birthday cake (which I must say I was pretty proud of – thank you Pinterest!) ended up being washed down with antibiotics, poor lamb. After having felt incredibly sorry for herself – with every reason, to be fair – she thankfully had brightened up for the big day, but was still dozy enough not to mind missing what was meant to be our annual trip to the aquarium. Instead we all spent the day playing at home, with birthday pizza for tea. Which, you know, turned out to be not such a bad way to spend it, all things considered. One positive of all this has come – where you might least expect it – in our bedtime routine. All of a sudden C’s decided that she doesn’t want one of us to climb in bed with her and hold her hands until she decides it’s time for sleep (all the while singing and shouting randomly – her, not us). Which as you can imagine didn’t stay cute for very long. Instead she climbs into bed, waits to be tucked in, drinks her milk and dozes right off, saying ‘no mama in!’ if I try to cuddle up next to her. I might miss her being my baby, but if this ‘little girl’ habit means fewer lost hours spent trying to get her off to sleep then I reckon I’ll be content with that. I’m not counting my chickens (or, indeed, their pox) just yet though.